Candidates agree wages have stagnated but their solutions differ. The Democrat focuses on middle class aid. The Republican looks to tax cuts. NEW YORK (CNNMoney.com) -- When it comes to stagnating wages, Barack Obama and John McCain agree on one thing: Americans are suffering. And that's about all they agree on. The presidential candidates have starkly different plans on how to reverse the years-long slide in workers' incomes. Democrat Obama's proposals of creating jobs through government investments are aimed at helping the middle class. Republican McCain focuses his plan on cutting taxes on businesses that he says will spur more jobs and keeping tax rates low so people have money in their pockets. Wage stagnation has made the downturn in the nation's economy is even more painful, economists say. Skyrocketing fuel and food costs have hit workers hard because their incomes largely have not kept pace with inflation during this decade. On Friday, unemployment hit a four-year high after employers trimmed 51,000 jobs, the Labor Department said. A day earlier, a separate government report showed that inflation-adjusted wages showed their biggest decline in the survey's eight-year history. "The problem is we never had robust job growth," said Jared Bernstein, senior economist with the liberal-leaning Economic Policy Institute, referring to recent years. "Job growth leads to wage growth." 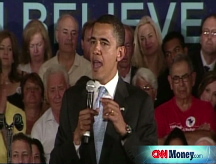 To spur an increase in incomes, Obama, the presumptive Democratic nominee, focuses his attention on the middle class. His plan calls for short-term relief, such as a $500 tax credit per person to offset rising gas prices and an extension of unemployment benefits. He also wants to put in place longer-term measures, including a $10 billion infusion for state and local governments and a $150 billion investment in clean energy, both of which he says will spur job growth. 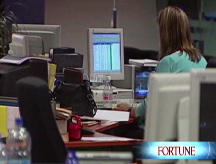 Obama has suggested raising taxes on those earning more than $250,000 to pay for the policies. "You're working harder than ever to pay bills that are getting bigger than ever and there's not much left over at the end of the month," Obama said in a speech last month. "We need to help hardworking families get ahead. We need to help the middle class succeed because that's when our economy succeeds." The Illinois senator would raise the national minimum wage to $9.50 an hour, up from today's recently increased rate of $6.55, and index it to inflation. And he would advocate for stronger unionization by protecting workers' ability to bargain collectively and by appointing union-friendly officials to the National Labor Relations Board. McCain also has some immediate relief measures, such as suspending the 18.4-cent federal gas tax, but many of his measures center on keeping taxes low. The presumptive Republican nominee wants to keep the top tax rate at 35% and maintain the 15% rate on dividends and capital gains. McCain also proposes cutting the corporate tax rate from 35% to 25%. 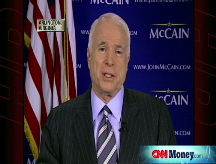 "There is much that needs to be done to get the economy on track," said McCain's campaign in a statement this week. "John McCain's Jobs for America Plan will ... keep taxes low to create good jobs here in America, and give American workers renewed confidence in their economic future." The Arizona senator supports lifting taxes and other government-imposed burdens from small businesses, the nation's job engine. He would overhaul unemployment insurance and worker training programs to make them more focused on getting people into new employment. McCain's philosophy is that by making America more competitive, companies will be able to create more jobs. "If you don't tax them, they can pay their workers more," said Taylor Griffin, the candidate's senior adviser. Not surprisingly, economist reviews of the candidates' plans follow their own political leanings. Liberal fiscal observers say Obama's proposals would help promote wage growth, while conservative watchdogs side with McCain. Bernstein, for instance, supports Obama's plan to invest in public infrastructure projects and alternative energy, saying these endeavors will spur job growth. He disagrees with McCain's "trickle-down" approach, noting it hasn't worked in the past. Brad Schiller, an economics professor who argues that individual's incomes have grown in recent years even though the average wage hasn't, said that lowering taxes is the way to jumpstart the economy, which will encourage companies to add to their payrolls. "Keep the pie growing and everyone will be better off," said Brad Schiller, who teaches at American University and the University of Nevada, Reno. Still, solving the wage stagnation problem is no easy fix, said Robert Kuttner, co-editor of American Prospect, a liberal magazine of politics and economics. The weak economy, however, offers Washington an opportunity to put in place measures that would boost Americans' earnings. These could range from providing better training and pay for service-sector jobs, such as daycare workers or healthcare aides, to implementing labor standards in trade laws so stem job flight abroad, he said. "It would take an enormous amount of presidential leadership to do this," Kuttner said. "It would take a national commitment to turn every job into a decent job."